Carter Pann's residency at Indiana University of Pennsylvania is generously sponsored by the Indiana University of Pennsylvania Department of Music. This forum is going to discuss questions with Carter Pann (Pulitzer Prize Finalist) such as what does it means to be a composer in today's society. How has composing changed his life? Who were and are your compositional influences? What brought him to composing, how to encourage others to compose, and where he sees this journey taking him? Time permitting, opening the floor to further discussions. Carter Pann will coach the IUP Wind Ensemble on his piece, Richard and Renee for wind ensemble and piano. Finalists Erika Andres, Alyssa Andriotis, Hannah Porter Occeña, and Sarah Steranka will perform the newly composed work Skinscape for flute and fixed media by Canadian composer Bekah Simms as well as a work for flute and piano of their choice. Ms. Simms will be in attendance and serve as a member of the judging panel. Therese Wacker, Professor of Flute at Indiana University of Pennsylvania and other members of the IUP music faculty will present a recital of music by Carter Pann including Quintet for a Day: Six Snapshots of Day-to-day Life for Wind Quintet., "An Irish Tune" and "She Steals Me" from The Piano's 12 Sides for piano, and Dr. Wacker will present a premiere performance of Carter Pann's new work for flute and piano, Giantess, with Sun Min Kim, piano. 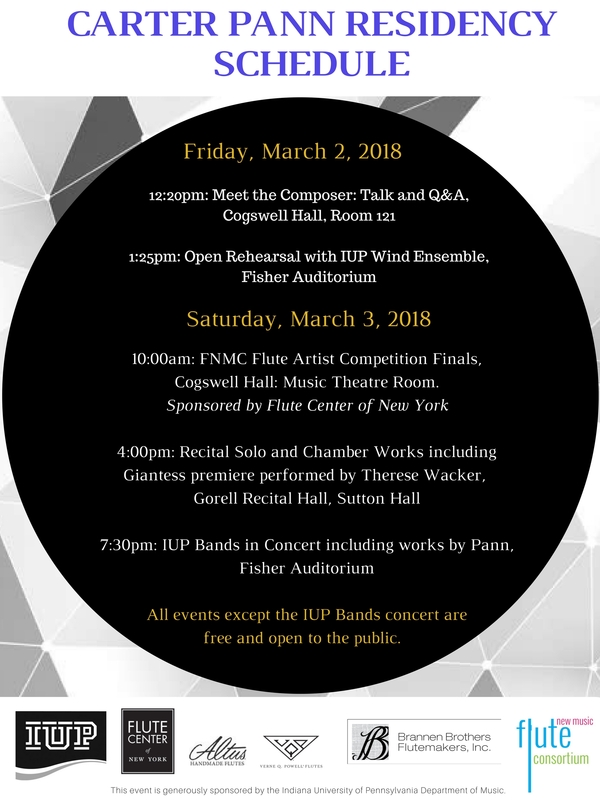 The IUP Wind Ensemble and Symphony Band will present a concert of works for wind band. The wind ensemble will be previewing the repertoire they will perform at this year's CBDNA convention at Yale. Repertoire includes Carter Pann's Richard and Renee for wind ensemble and piano as well as works by Martin Ellerby, Charles Ives, Robert Litton, and Vincent Persichetti.